← Make Way for the Hot Mess Express! We had planned to be farther along in our drive, but found ourselves in Wichita around lunch time. Normally I have a few places jotted down as options for places to eat, but I had nothing but a place called Bobo’s that was featured on Diner’s Drive-ins and Dives a few years ago. Seeing as it truly was a drive in, we nixed that idea so that we could find a place where we could at least get out of the car. We had no idea where to eat, so we Facebook messaged a friend back in Austin for recs (the conversation went something like this – Chas, I feel like I remember Guenthner traveling to Wichita – I think he might be from here -he’s totally a foodie- would you Facebook msg him?” Guenthner had great recs and he and Chas bantered back and forth about the changing demographics of Wichita, etc but we found that most of his recs were across town from where we were. Then Chas says, “I found a place!” And navigated us a short distance to an establishment with no cars in the parking lot and a sign that said “Fried Chicken and Seafood.” I love a good dive restaurant as much as anyone, but whoa. Something about this place suggested to me that we would all be laid up with food poisoning if we chose this place. We moved on to another little dive that at least had several cars in the parking lot. 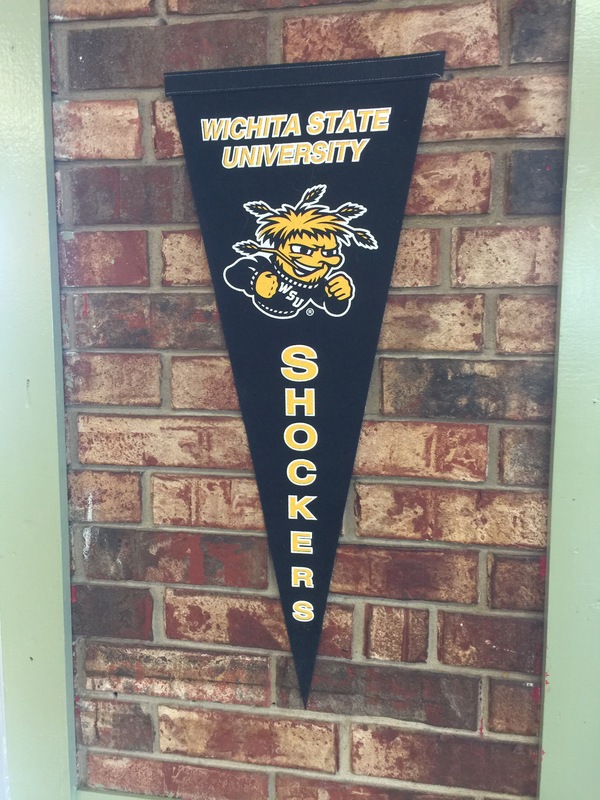 They had a LOT of stuff inside touting the local college – Wichita State. Unfortunate mascot/team name? You be the judge. We were really really tempted to visit an aviation museum in Wichita, but pressed on to Topeka. This entry was posted in Big Adventure 2017, Vay-cay and tagged kansas, wichita. Bookmark the permalink.